The discovery of mirror neurons by Giacomo Rizzolatti and his group (1996) in Parma, Italy, has been perhaps the most discussed event in basic neurophysiology in recent years, and it is of great significance for understanding fiction. The original discovery was of neurons in monkeys that fired when the monkey saw a particular intended action—picking up a raisin—and also when the monkey itself performed the same action. Recent findings from this group of researchers have implications for reading and listening to stories. One cannot directly record the activity of mirror neurons in human participants; it would be totally inappropriate to implant electrodes in people's brains. So, to study the mirroring system in humans one has to find what computer people call a work-around. In one ingenious work-around, Giovanni Buccino and his colleagues (2005) used a method called Transcranial Magnetic Stimulation (TMS) to stimulate briefly and gently (from outside the skull) the parts of the brain known to be directly responsible for initiating actions. For instance they could stimulate the part of the brain responsible for making hand movements and record the electrical activity of the muscles of the hand that resulted. The could do the same for foot movements. 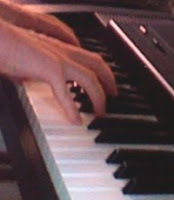 What would happen now, the researchers asked, if the human participants were stimulated in this way and at the same time were asked to listen to three-word sentences that concerned making either a movement of the hand such as "Suonava il piano" (He played the piano) or of the foot such as "Calciava la palla" (He kicked the ball). What they found was that when the participants listened to sentences concerning hand movements, the electrical activity recorded in the hand muscles in response to the transcranial stimulation was reduced. This reduction did not occur when participants listened to sentences about foot movements or sentences that did not indicate movement. Similarly, when listening to sentences about foot movements, the stimulation-elicited electrical activity in the foot muscles was reduced as compared to the activity that occurred when listening to sentences about the hand or to sentences that were not about movement. The reduction of electrical activity in the hand or foot muscles in response the stimulation occurred because the parts of the brain concerned with initiating hand or foot movements were already occupied with the understanding the sentences that concerned those particular movements. When we understand a sentence there is activation of the areas of the brain concerned with hearing and language. The finding of Buccino and his colleagues showed that, in addition, when sentences were about actions, there were also measurable effects in the areas concerned with making the same actions. Extending the idea, members of the same research group (Glenberg et al., 2008) found comparable effects while people read sentences that were about either physical transfer of something away from the person (e.g. "You give the papers to Marco"), or abstract transfer for instance (e.g. "You delegate the responsibilities to Anna"), but not when the transfers were in the opposite direction (towards the subject). The researchers interpret their findings in terms of mirror neurons. Recognition of an action, even in the imagination when we hear or read about it, and even when a sentence is about transfer of something non-material, involves brain systems responsible for initiating that action. The researchers also link the effects of non-material transfer to theories of metaphors as based on embodiment (Lakoff & Johnson, 1980). For the psychology of fiction, the implication is that when we read, or go to the theatre or cinema, and identify with a character, and when we put ourselves in his or her shoes (almost not a metaphor), we partly enact what that character is doing. It is in that way, perhaps, that we come to understand within ourselves (at least partly) the actions about which we read. I wonder whether, as Elaine Scarry (1999) has proposed, that the particular way in which a writer portrays an action makes a difference to the vividness with which we imagine it and embody it in ourselves. G. Buccino, L. Riggio, G. Mellia, F. Binkofski, V. Gallese, & G. Rizzolatti (2005). Listening to action-related sentences modulates the activity of the motor system: A combined TMS and behavioral study. Cognitive Brain Research, 24, 355-363. A. Glenberg, M. Satao, L. Cattaneo, L. Riggio, D. Palumbo, & G. Buccino (2008). Processing abstract language modulates motor system activity. Quarterly Journal of Experimental Psychology, 61, 905-919. G. Lakoff & M. Johnson (1980). Metaphors we live by. Chicago: Chicago University Press. G. Rizzolatti, L. Fadiga, V. Gallese & L. Fogassi, L. (1996). Premotor cortex and the recognition of motor action. Cognitive Brain Research, 3, 131-141. E. Scarry (1999). Dreaming by the book. Princeton, NJ: Princeton University Press. Hey-- interesting post, I'll have to check out Buccino's work. Something in return: Lisa Aziz Zadeh actually did fMRI research that compared brain activity when hearing motor phrases ("biting the peach") with phrases that used motor metaphors ("chewing over the idea"), and found that the latter did not activate neurons in motor context. This could be a blow against the Lakoff theory of metaphor. At least for so conventional a metaphor, it seems we are not using any kind of mirror activity to process these phrases. Thank you very much, Olly, for this comment. I have just looked up Lisa Aziz Zadeh on PsychInfo, and found four published articles but not yet the one on this issue of "biting the peach" as compared with "chewing over the idea." I guess it is not out yet, or perhaps it's in some pre-publication phase. It would, as you say, be a blow against the Lakoff theory, which does seem a bit overextended. And also it will be worth looking into the difference between what Aziz Zadeh has found and the Buccino et al. data. Very interesting. If you have a reference, I'd love to see it (my e-mail address is in my Profile), and would be happy to do a post on it. Metaphor isn't the main focus of the paper, and she registers some concerns about method-- I'd be interested to hear your thoughts on it. Thanks very much indeed Olly. I have found the reference you mention in Current Biology (2006) and also a more recent review article by Aziz-Zadeh and Damasio on fMRI in relation to the embodied metaphor idea of language, in Journal of Physiology - Paris, (2008). So I will have a read and a think and do a post on this issue. I'm grateful to you for putting me on to this.